sailboat. 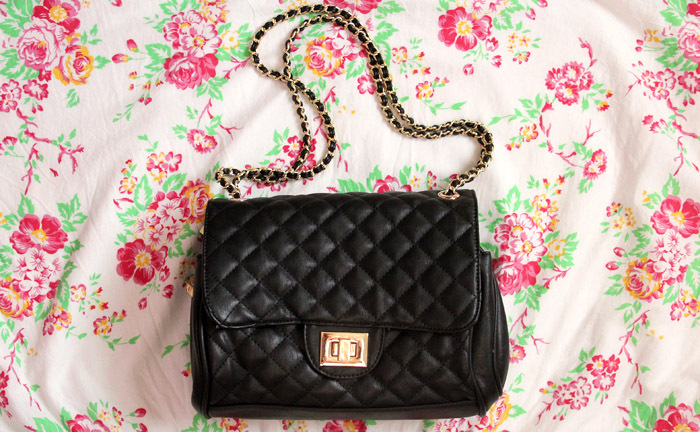 : Marc B Knightsbridge Quilted Bag: What's in my handbag? 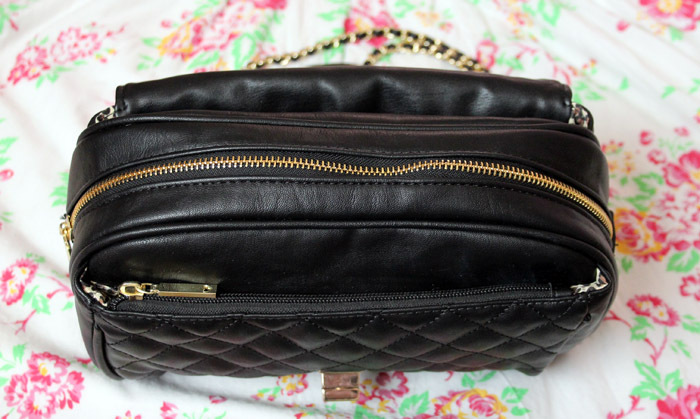 Marc B Knightsbridge Quilted Bag: What's in my handbag? Marc B Knightsbridge Quilted Bag♦ // Disaster Designs Dandy Wallet. // Sony Xperia U & eBay Case. // MAC Fresh Air Tinted Lipglass. // Hello Kitty Mirror. // Soap & Glory Hand Food hand cream. // Cough sweets. // Japonesque Blush Brush♦ // Burberry Body perfume. // Figs & Rouge Rambling Rose 100% Organic Balm. // Dior Rosy Glow blush. It's safe to say that the Marc B Knightsbridge Bag is the closest to a Chanel bag that I'm ever likely to get, but that's okay because I happen to really really love this bag! There's something I will always like about black quilted bags with a gold chain handle, it's a classic combination and I especially like that this bag is casual enough to use daily, but still nice enough to wear out on date night! 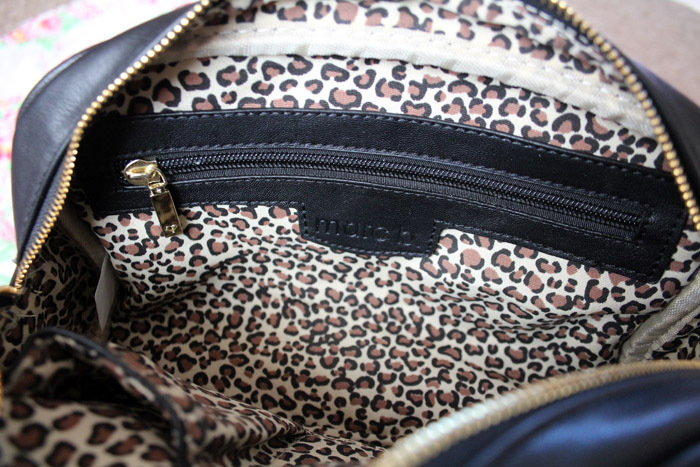 I must say, it's much more roomy inside than you'd think with multiple pockets & compartments but it's not too bulky. The bag comes with a detachable heart charm that I've put on my keys, but as you can tell from the lack of keys in the pictures, I've put them in a safe place and forgotten where said safe place is. Oops! I like that the charm is detachable and they haven't put a huge logo on the front of the bag, I think that if you're familiar with the brand it's recognisable as Marc B and if not, it just looks classic and chic. My boyfriend and I went out to run a few errands (and pick out our new Christmas tree ornament each for the year!) & this is what I took. I have a million and one outfits I need to photograph but my boyfriend has been working away for the last few weeks so we haven't been able to spend much time together and blog things have been somewhat put on hold whenever I do get to see him. I'm still using my Disaster Designs Dandy Wallet and I love it. It's held its shape really well and doesn't look tatty at all despite daily use. I am kind of lusting after something new though, maybe something black with gold hardware but I'm super picky so I'll have to keep an eye out! Other than that I always have my phone, complete with super cute cat phone case that's totally obnoxious but I adore it and a few make up items. I'm not really one for touching up my make up throughout the day but I like to have a lip balm, a gloss (this is just a MAC one that I'm trying to use up) and a blush. This Japonesque blush brush is the perfect size to pop in my bag and it applies blush perfectly, I really don't use it as much as I should! I love this kind of posts! The bag is indeed lovely :) I usually carry a lot of stuff in my cotton totes, I try to keep it organized and stripped but I tend to end up carrying a lot of things I don't really need anyway. Which doesn't make my shoulder that happy! My shoulder is never happy either! Love your bag...and that hand cream is one of my favourites (along side Dove). These are my fav types of posts as I am such a nosey cow!! 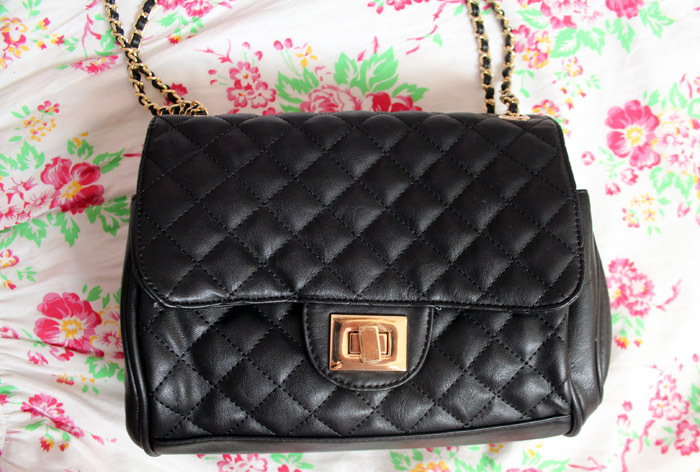 I love quilted bags so I think that one is so cute. I really like the look of that Japonesque brush as well as your adorable cell phone cover. 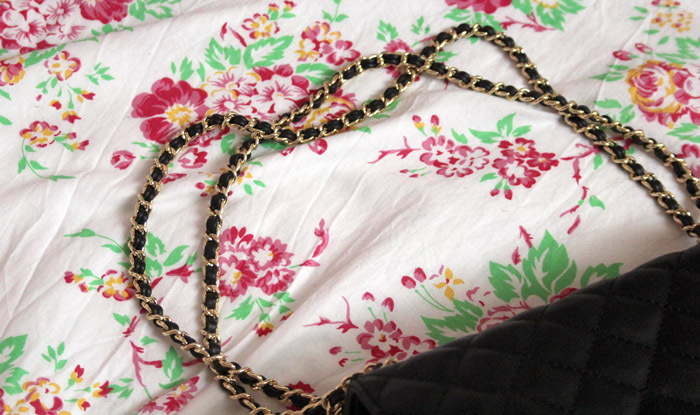 Great post, I love your bag and that phone case is so cute! This is such a cute bag! And the phone case is, too!